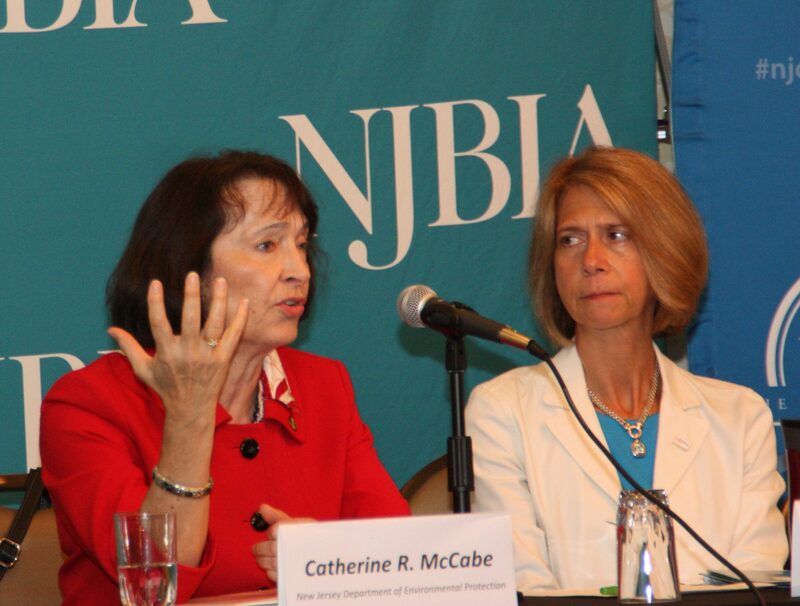 DEP Commissioner Catherine McCabe (left) responds to a question at the June 19 Meet the Decision Makers event as NJBIA President and CEO Michele Siekerka listens. According to the new Commissioner of Environmental Protection, the key to a vibrant economy and a healthy environment is the same—a solid, strong and clean energy base. Speaking before business owners from NJBIA and the NJ Chamber of Commerce just hours before her formal swearing in, Catherine McCabe said building that energy base begins with rejoining the Regional Greenhouse Gas Initiative or RGGI. The Murphy administration is making clean energy a top priority, and McCabe sees RGGI as an ideal fit. RGGI establishes a cap on the amount of CO2 power plants can emit by issuing a limited number of tradable allowances. Power generators purchase the allowances through auction, with the proceeds redistributed back to the participating states. New Jersey helped create the program but pulled out it of just before it went online in 2009. Rejoining RGGI isn’t that simple, however. “Getting back into RGGI is a little more complicated than leaving it was,” McCabe said. The administration is negotiating with the nine states currently in RGGI to make sure that New Jersey’s emission’s cap is set at a reasonable level so it doesn’t cause any spike in energy prices for consumers. 10 percent to promote restoration of forests and tidal marshes. While the state may have missed out on RGGI proceeds, New Jersey’s power sector has performed impressively. McCabe said power generators have become much cleaner over the years as the old coal and oil fired generators are being replaced by with cleaner burning natural gas units. McCabe said she views the economy and the environment as linked.